After the rather incredible response to my review of The Who's album Who's Next, I decided to listen to another absolutely brilliant album from the same era. That album is Led Zeppelin IV by Led Zeppelin. Technically, the album has no title, but is called Led Zeppelin IV following the naming structure of the first three albums, but is also known as Zoso or Four Symbols. We'll stick with Led Zeppelin IV. Now, as a band, Led Zeppelin have already garnered some attention from me in another column, as their first two albums were mind-blowing. But this album has gone down as their pinnacle. Every track is a good one (or better than just 'good') and it holds what has become the epitome of classic rock in the track 'Stairway To Heaven'. It is probably unfortunate that this album is all many people remember of the members of Led Zeppelin. While John Bonham sadly passed away in 1980, the other three members have continued to release some awesome music. Robert Plant's output has covered a wide variety of styles and musical genres, but for me his best work was the album Raising Sand with Alison Krauss. Just amazing. Jimmy Page has released some good albums, Outrider being great, No Quarter with Robert Plant superb, and Coverdale/Page with David Coverdale amazing. John Paul Jones, on the other hand, has been a little quieter, but when he was involved with a band as great as Them Crooked Vultures, you know he was far from restring on his laurels. 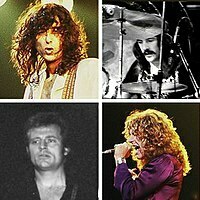 Still, for all of them, the spectre of Led Zeppelin hangs over them like a shadow of the past. Thus we come to this album. After the magnificent debut Led Zeppelin, its amazing follow up Led Zeppelin II and the different Led Zeppelin III, in 1971 the band released this album. There is a reason it is referred to as a classic. Side One (yes, I will still refer to sides… live with it) opens with a guitar, and the Robert Plant's voice: "Hey, hey, mama, said the way you move, makes me sweat, makes me groove…" 'Black Dog' is the track and the sonic assault starts straight away. With a unique tempo pattern, an incredible guitar riff and Plant's soaring vocals, you know straight away that this album is different. One of the great opening tracks from any album. What follows next is a statement of intent. 'Rock And Roll' tells the listener exactly what they are getting here: "Been a long time since I rock and rolled…" are the opening words. With some wild Bonham drumming and another incredible guitar riff, this song might be almost nostalgic in its theme, but this (along with The Who) is where hard rock learnt its trade. 'The Battle Of Evermore' featuring Sandy Denny helping out with vocals is next, and this change of pace is really well timed and it is a tribute to Page's production that it does not jar. Featuring mandolin, this folk-rock turn is a beautiful song, based on something from Scottish history. The closest thing to a ballad on the album. And then, to close out side one, we have the elephant in the room – 'Stairway To Heaven'. This song still consistently appears at or near the top of lists of Greatest Songs of All Time, and yet many nowadays feel the need to lambast it. In the 80s/90s, in music shops, I remember seeing signs telling people trying out the guitars that 'Stairway To Heaven' (and 'Smoke On The Water') were NOT to be played. And then we have Andrew Denton's frankly awesome Stairways To Heaven, an album featuring more than twenty different interpretations of the song, in styles ranging from The Beatles to Elvis Presley, from spoken word to jazz. I'm not talking about the song itself, am I? I have trouble understanding just what the lyrics mean ("If there's a bustle in your hedgerow don't be alarmed now / It's just a spring-clean for the May Queen…"), but who cares when the music is just so incredible. Slow start, gradual build, wild guitar solo, come down for a finish – a template copied by so many subsequently. Even at 8 minutes, it does not overstay its welcome. As well as Page's incredible, but not over-blown, guitar solo, there's Jones on electric keyboards and Bonham's stunning drumming and Plant's incredible vocals. Look, anyone who is into classic rock knows the song, and anything else I say about it will be superfluous. A stunning piece of music. A lot of people I know only listen to side one. With the three big songs from the album, plus Sandy Denny adding beauty to the fourth track, they feel it is all they need. But then they miss out on the rest of what is, simply, brilliance on vinyl. Side two opens with 'Misty Mountain Hop', a song about students and police clashing over drugs. It feels like a hippy sort of song dosed to the eyeballs, folk meets hard rock. The electric piano that underpins it and the pounding drum beat give this a controlled sense of rhythm and urgency that also sets it apart from the rest of the album. 'Four Sticks' is next. This track was written, it seems, just so John Bonham could show his drumming skills. The four sticks of the title refers to the fact he played the drums with four sticks, which gives it a sound that is so hard to replicate. There is a reason why Bonham is regarded as one of the best rock drummers of all time. Where Keith Moon was maniacal behind the kit, Bonham played with controlled fury that has such a unique feel. Next we have an ode to hippy-dom – 'Going To California'. Like many songs about that time and place, it is wistful and nostalgic, considering when it was written and recorded. Sweet and rather pleasant, it is another track that is different enough to stand out. And the final track is 'When The Levee Breaks', Led Zep's take on the Memphis Minnie blues belter. It is a rocking take on the blues, almost to remind the listener where the music has come from. 7 minutes of the blues, amped up enough to be distinctive. And a fine way to close out the album. 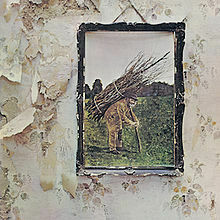 Much like Who's Next, every song on Led Zeppelin IV is good or better. For those who just listen to side one, they are missing out on some great stuff; for those who think the three headline tracks are over-played, listening to the whole album in order really puts things into a better perspective. In the old days, track placement was as important as the tracks themselves; Led Zeppelin IV shows this in spades, so that the tempo and music is spread well across many styles. The songs on this album get a lot of love; the whole album is really worth your time.